The Wellington Abrahamic Council is sponsoring a series of evening meetings to help foster understanding and friendship between people from the three Abrahamic faith traditions in Wellington. We will meet in each others’ homes to reflect together on a theme expressed in a selected passage from the sacred scriptures of each of the three Abrahamic faith traditions. Each of us will listen to the other participants sharing their understanding of the selected scripture from their faith traditions, in turn sharing our understanding of the scriptures from our own tradition. 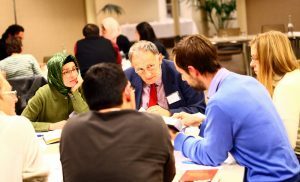 The evenings will use Scriptural Reasoning, a tool for interfaith dialogue developed by the Cambridge University Interfaith Programme and now used in a number of countries. We will use the guidelines and text packs, available at their website. For the first meeting we will use the first text pack, Abraham’s hospitality, which can be found in the Resources section of the Scriptural Reasoning website. Our shared aim is to understand more deeply the perspectives of the other Abrahamic faith traditions and, in this light, to understand more deeply our own faith traditions. From this we hope to better recognize our shared understandings and values and appreciate positively our differences as faith traditions that come from Abraham, our father in faith. Do consider coming along on Wednesday 29 March 2017 at 7:30pm, and don’t forget to RSVP.